Star World 1 is the first Star World level accessible by the Donut Plains Star Road in Super Mario World. The main characteristics of the level are the amount of Rotating Blocks and a rare red-colored Baby Yoshi. The grassland theme plays in this level, despite the level taking place underground. The level consists of one really tall underground area, and a short screen with the level goal. The player starts at the top of the underground area, next to a Super Mushroom, and has 300 seconds on the Timer to finish. The level features many rare items, including three Super Stars and a 1-Up Mushroom. Wielding a Cape Feather allows the player to be able to spin the Rotating Blocks instead of just Spin Jumping to destroy them. As with all Star World levels, there are two ways to complete the level. Middle left (Eight blocks from the left, grab the Dragon Coin then continue straight down from where the another Dragon Coin appear). If the player collects all the Dragon Coins, an extra life will be awarded. After that, the player should make their way through the remaining turning blocks on the left, grab the star, and run on top of the turning blocks until they can drop down. Then the player should change directions and repeat, picking up the red-colored Baby Yoshi along the way, and feeding it enough Koopa Troopas and Winged Koopa Troopas to make it grow. Once at the bottom the player simply needs to go through the Warp Pipe on the right and cross the goal waiting on the other side. To find the Key and Keyhole, the player should Spin Jump down the right-most turning block column until a platform with both the Key and the Keyhole is reached. 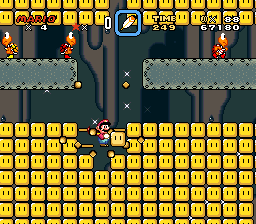 Beating the level this way will allow the player access to Star World 2.